Stepping Stones Museum for Children is celebrating the holiday season with special events and activities. Enjoy holiday performances, dancing snow people, spectacular wintery scenes and so much more! The holiday season is here, and Stepping Stones Museum for Children is ready to help children and their families celebrate with special events, activities and performances. Every day there will be something different in store for families to enjoy. From noon to 4:00 pm on Saturday, November 22, Stepping Stones will be hosting the YES2 Holiday Craft Fair. Join the Youth Enrichment at Stepping Stones (YES2) program for their second annual Holiday Craft Fair. Browse and buy handmade crafts and merchandise created by the youth in the program. Get a head start on holiday shopping and support young entrepreneurs as they learn about business and commerce, while spreading the holiday spirit. The Holiday Craft Fair is free with museum admission. Cash only will be accepted for all merchandise sold. Stepping Stones Museum will be closing at 3:00 pm on Wednesday, November 26, and will be closed all day Thursday, November 27 for Thanksgiving. The last Storybook Pajama Party of the year will be held from 6-8:30 p.m. on Friday, Nov. 14. The museum invites children and their families to come down and listen to their favorite story in their pajamas. On Nov. 14, the story will be the iconic 1964 Caldecott Medal winner for the Most Distinguished Picture Book of the Year, “Where the Wild Things Are.” The event is $10 a person for members and $15 a person for non-members. Space is limited, so registration is required. Register at https://secure.acceptiva.com/?cst=2dcc64. The holiday season is the time for parties, and Stepping Stones has the perfect rental space available. The museum offers a unique, one-of-a-kind space for all kinds of special events. With their whimsical galleries, gardens and exhibit space, Stepping Stones can accommodate a party of any size. Find more information about Facility Rentals online, or call 203-899-0606 for more information. Stepping Stones invites children and families to celebrate the holiday season with them this year. 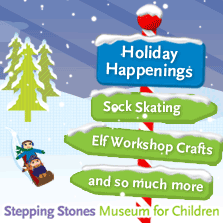 Visit the Stepping Stones website for a full list of holiday events going on now through the end of the year. Stepping Stones Museum for Children is celebrating its 15th birthday! The official birthday is March 11, 2015. The museum is celebrating for 15 months from Oct. 2014 through Dec. 2015. Visit the calendar of events on the website regularly to see activities planned for the 15th of each month, including the Birthday Party on March 11, 2015.